Why Are So Many Rays Dying In Lake Merritt, And Sharks At The Berkeley Aquatic Park? A large number of leopard sharks died last year at the Berkeley Aquatic Park, possibly due to broken tide tubes. A surprising number of sharks and rays are turning up dead in East Bay tidal lagoons, including more than a dozen bat rays in Lake Merritt since February, and nearly 100 leopard sharks that died in the Berkeley Aquatic Park last spring. Conservationists are perplexed by the recent phenomenon: It’s the first time anyone can recall so many bat rays dying in Lake Merritt. Volunteers with the Lake Merritt Institute, a nonprofit founded in 1995, first noticed dead rays in mid-February. They tried to track down other sightings via social media, including Reddit, and on the crowd-sourced wildlife reporting website iNaturalist. In all, there have been at least 15 reports of dead rays since February 11, though it’s hard to say if some of those are the same fish that may have drifted elsewhere in the lake. On February, 21, Institute volunteers found a three-and-a-half-foot ray while scooping trash out of the Glen Echo Creek inlet, near Children’s Fairyland. Most of the others have been found on the lake’s east side, near Lakeshore Avenue, or on the southern end, near the 12th Street Bridge. But as Institute board member Katie Noonan explained, the currents could have swept them there, so it’s impossible to know where in the lake they were dying. “One thing this event has pointed out to us is we don’t have a really clear protocol or pathway of what to do when this happens,” she said. Noonan wrote an article for the Institute’s newsletter, “Tidings,” documenting the dead bat rays and suggesting possible causes. A science teacher in Oakland Unified School District for 25 years, Noonan retired in 2014 and joined the Institute’s board last year. She looked through the old records, newsletters, and talked to people who have watched the lake closely for a long time, but found no record of there ever being such a large die-off of rays in the lake. Sean Van Sommeran, a shark expert who helped found the Santa Cruz-based Pelagic Shark Research Foundation in 1990, agreed that it was an unusual event for Lake Merritt, and said he’d never heard of rays dying there until this year. The rays all appeared to be in the same state of decomposition, and presumably died at about the same time, he said. In the Institute newsletter, Noonan speculated that stratification of the lake could be a culprit: After periods of rain, low-density rainwater can “float” above the saltier estuary water, with the lower level becoming depleted of oxygen. But tests of the water in mid-February and early March, with the help of Oakland High School and Laney College students found, little stratification; at the bottom of the lake, salinity was low and dissolved oxygen was higher than usual. However, they took no measurements in January before the trend started, so it’s unclear what the conditions were like when the rays started dying. Though stratification might not be to blame, it has been an ongoing concern for conservationists, and ensuring that the lake water is flushed regularly and maintains oxygen levels is a constant challenge. One method is the aeration fountains, maintained by the institute, but those can only do so much. Opening the tide gates to the bay mixes the layers and replenishes the water with oxygen. Tide gates are an important mechanism to keep tidal shifts from flooding surrounding areas during periods of heavy rainfall. Most of the time, the gates are open. But they close when there’s a 50 percent chance of rain, allowing water to drain into the bay but not come in to the lake. As the city continues working on the Lake Merritt Channel as part of ongoing infrastructure improvements at the lake funded by Measure DD bonds, it is also studying ways to keep the tide gates open more often. In the Institute’s newsletter, Noonan called for more transparency in the tide-gate operations and more complex method of determining whether they will be open or closed than the precipitation forecast. 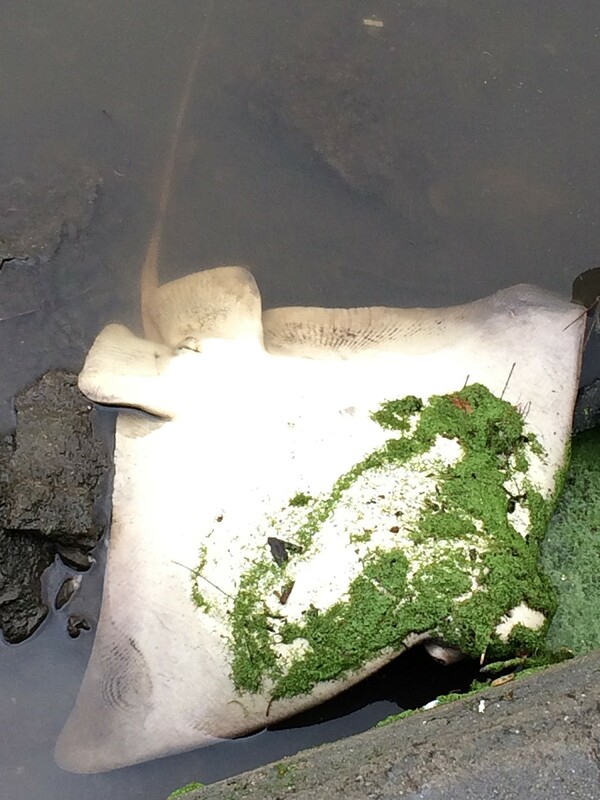 A dead bat ray found in Lake Merritt on February 21. In Berkeley, a much larger die-off of leopard sharks occurred at the Berkeley Aquatic Park last year. This might have had something to do with its tide tubes, which have been broken for years. Nearly 100 sharks were found in various stages of decomposition. Van Sommeran said it appeared they’d been dying off in bouts, and accumulating over a period of time. But because most of the sharks were extremely decomposed by the time he discovered them, it was difficult to draw any conclusions about how they died. “It was the biggest concentration of dead sharks we’ve seen since 2011,” Van Sommeran said. In addition to Berkeley, he encountered dozens of dead sharks in near Redwood City, as well as Foster City and Oyster Point. More troubling is that the sharks at that time of year are typically pupping, so the impact on the overall shark population could be greater. “As a conservationist, that’s alarming, because you see a dozen dead sharks, but each shark is loaded with other sharks,” Van Sommeran said. He speculated it could be related to the long-broken tide tubes that run under Interstate 80. Berkeley spokesperson Matthai Chakko said the city has no evidence that tide tubes are linked to last year’s shark die-off. But he acknowledged that the city never researched the issue, so how the sharks died will likely remain a mystery. Three out of the five tide tubes have failed, limiting the removal of stormwater and causing flooding along the aquatic park during periods of heavy rain. To design a repair plan, the city recently allocated $250,000 in revenue from Measure T1, a $100 million infrastructure bond passed by voters last November. Built in the 1930s, the tide tubes were deteriorating and collapsing even a decade ago. 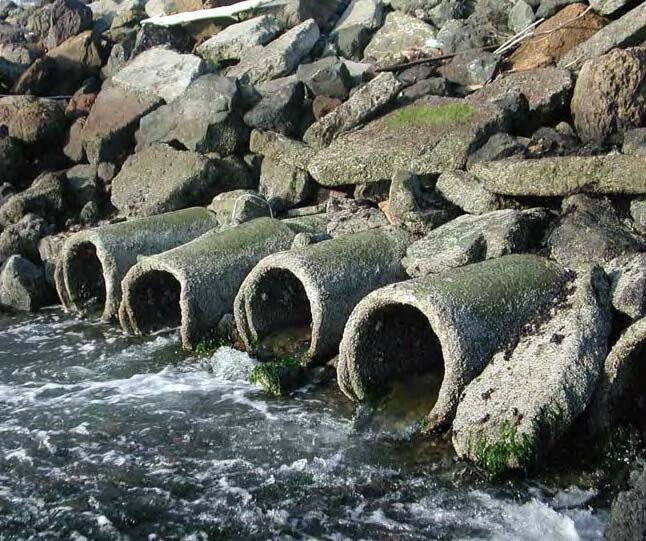 A 2008 city report on the aquatic-park watershed found that installing new tide tubes would be expensive and infeasible. But if not replaced, the increased stormwater could decrease the salinity and increase the amount of pollutants entering the lagoon. While bat rays and leopard sharks aren’t protected species, Van Sommeran said their populations have diminished from historical times, and used to be much more abundant — and would even grow larger in size than they do today. Leopard sharks are fished for food or sport, and could be overfished, but since new regulations were enacted in the 1990s they are considered a species of least concern. While there has been no clear indication that pollution is to blame in the Berkeley and Lake Merritt cases, in the past pollution has caused large shark strandings. Van Sommeran pointed out that he traced some previous strandings in the early 2000s to spills by Cargill Salt, which was pumping bittern across the bay between Redwood City and Newark. In 2007, the company had to pay a $228,000 fine for violations of state water pollution law.